Caqui / Persimmon,( pronounced - Ka-ki) an exotic, seasonal fruit looks very much like a tomato. You're likely to mistake it for a tomato at first glance. It has a marvelous texture and exquisite taste,(like chickoo/sapota) but also has some wonderful nutritional properties.In terms of nutrition, the caqui is a very low calorie fruit, ranging between 75 to 85 calories per 100 gram serving, making it a potential winner with diet enthusiasts. It's also a very good course of vitamins A, B1, B2 and E, as well as calcium, iron and protein. 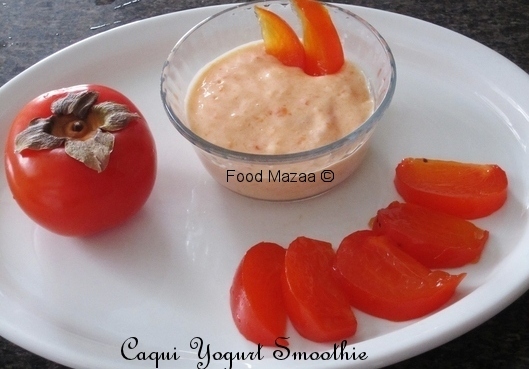 Peel the caqui and blend it with yogurt. The fruit is so sweet that you don't need to add any sugar or honey. Perfect breakfast idea for kids. For variation you can even add crunchy cereal to it. so nice and simple. the color is awesome! very nice dear...never heard of this fruit! very different fruit and like the relish. Looks delicious.First time here.U have a lovely space.Glad to follow you. Thanks .. will surely do so. This fruit is new to me and the drink sounds great. Love this sugarless and healthy smoothie! wonderful looking dish, never tried using persimmon though i've heard of it.